Click here to learn the basics of the L2L program with a free, downloadable program overview booklet! Once you've read through the information, email us or call us at (334) 215-0251 to begin an L2L program at your congregation! Since our foundation in 1968, the mission of L2L has been to develop youth into Christian leaders. From a group of eight boys in that first year to more than 20,000 today, our mission has remained the same. Along with producing Biblical materials designed for classroom or individual study, each year a new version of our Scripture-based study book, Pearls, is published. In the Pearls series, sound authors give an in-depth study of the Biblical truths found in the Bible Bowl book(s). Many churches use these excellent materials to involve the whole congregation. L2L provides an opportunity to take Bible bowl to the next level. Students do not simply memorize scripture. They are given the opportunity to learn the meat of the Bible bowl book through 13 lessons written by spiritually sound authors in our annual Pearls study series. To see a sample chapter, click here. L2L divides events into two categories: year-round and convention/pre-convention events. Year-round events are carried out at the home congregation on a convention-to-convention basis. There are year-round events for both students and adults. In fact, 10 year-round events are for all ages. This encourages participation among youth, adults and senior adults and helps the congregation to bond. 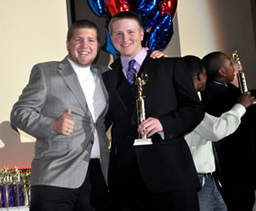 Year-round events are awarded during the Friday evening award ceremony at convention each year. There are four types of year-round events: Bible, Service, Leadership and Curriculum. Convention and pre-convention events take place in conjunction with the annual convention held on Easter weekend in many locations across the United States and in other countries. Convention events provide an avenue for students who have practiced and trained all year to show their developing skills and talents. Pre-convention events are completed at the home congregation shortly before convention and are awarded at convention. To see our convention locations click here. The training tools that are part of the L2L program may be adapted to your congregation’s unique needs. No two congregations participate in exactly the same way. The year-round and convention events result in a well-rounded, confident, spiritually grounded individual that has the right foundation to be a worker for the Lord from youth through adulthood. 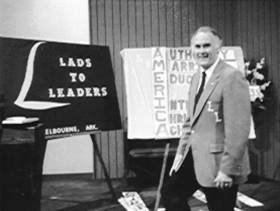 Over a quarter of a million participants have obtained leadership training through the L2L program since 1968. While many congregations are losing half or more of their youth, congregations that incorporate L2L events (especially year-round) are reporting youth retention rates of 85% or higher, ten years after graduation. What makes the difference? The year-round concept (L2L is not a one week-end youth event) and involving youth in regular study into God’s Word produce results. L2L is not just about preparing for a yearly convention. Click here to see an inspirational video from one of our board members, Brother Gale Nelson. Call us at (334) 215-0251 or email us to find out how you can get your congregation involved in Lads to Leaders/Leaderettes!